If you're seeking a conveniently located, amenity-filled Kissimmee getaway, look no further than this charming 3-bed, 2-bath vacation rental condo! Situated in the Villas at Laguna Bay, this home offers access to a community pool, playground, tennis court, and clubhouse. 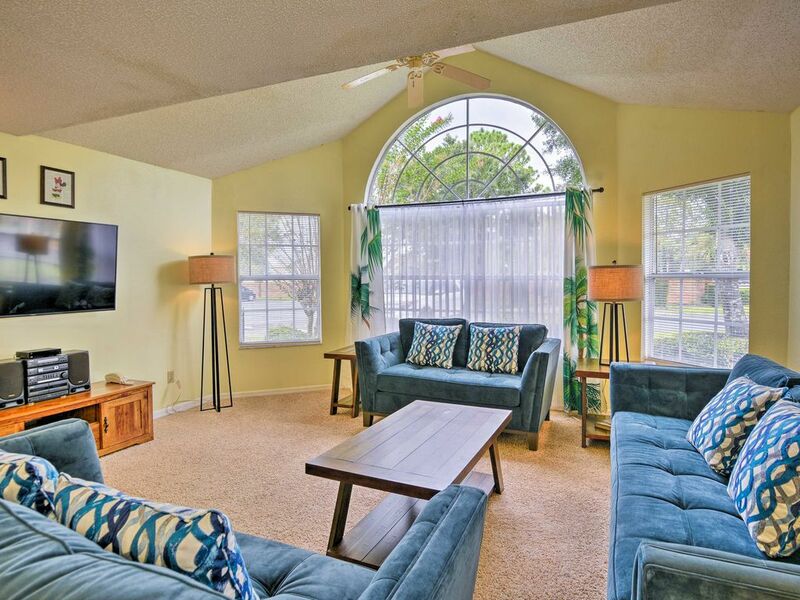 Whether you're in town for a relaxing golf trip, to explore the many attractions of Orlando, or to visit the wonderful world of Disney only 15 minutes away, you'll love having this spacious 8-person retreat as your home base! Make your way to sunny Florida to find this inviting first-floor unit located right next to the community pool! On leisurely days, you'll love taking a dip in the pool or hot tub, practicing your swing on the tennis court, or utilizing the expansive clubhouse's pool table and fitness center. After being out and about, retreat to the condo to relax in the living room appointed with 3 plush sofas and a 55-inch flat-screen cable/Smart TV. Neighboring the main living space is the dining area and fully equipped kitchen offering the perfect spot to entertain! When everyone needs a little quiet time, they can retreat to the 3 bedrooms, all featuring a flat-screen cable TV! Curl up under soft linen sheets, pop on your favorite TV show, and comfortably drift to sleep. The third bedroom is Disney-themed for the kids! The terrific location of this home places you within 9 miles of Disney World's many theme parks! Have a day of thrills at Magic Kingdom, make a splash at Blizzard Beach, catch an event at the ESPN Wide World of Sports, or get your shop on at Disney Springs. There are many more shopping centers dappled all over Kissimmee and Orlando, including the Lake Buena Vista Factory Stores, The LOOP, and Orlando Vineland Premium Outlets. To explore more of Kissimmee, head over to Kissimmee Lakefront Park or Gatorland! This property is also only 9 miles away from SeaWorld, Discovery Cove, and Aquatica! Orlando is brimming with several more renowned attractions, such as Universal Orlando Resort and Fun Spot America. For those who are golf lovers, there's certainly no shortage of courses in the area! Falcon's Fire Golf Course, Celebration Golf Club, and Waldorf Astoria Golf Club are all within 20 minutes of the home. - Amenities include fully equipped kitchen, a 55-inch flat-screen cable/Smart TV, 3 flat-screen cable TVs, free WiFi, central heating and air conditioning, linens, towels, in-unit laundry machines, parking for 2 vehicles, and more! - Community amenities include a pool, hot tub, playground, tennis court, clubhouse, fitness center, and more! - Amazing Kissimmee Location - Minutes from an abundance of theme parks, shopping centers, restaurants, golf courses, Disney World, and Orlando!